Saskatoon is native to the uppermost cold part of the North America. It can greatly adapt to grow under a wide range of environmental conditions. These berries were used as a major food source by the native people and early settlers. Till a few decades ago, these were available in the wild only. But now the growers have become interested in cultivating this fruit on commercial scale. Organized efforts have therefore been started for its domestication and positive results have now started coming. 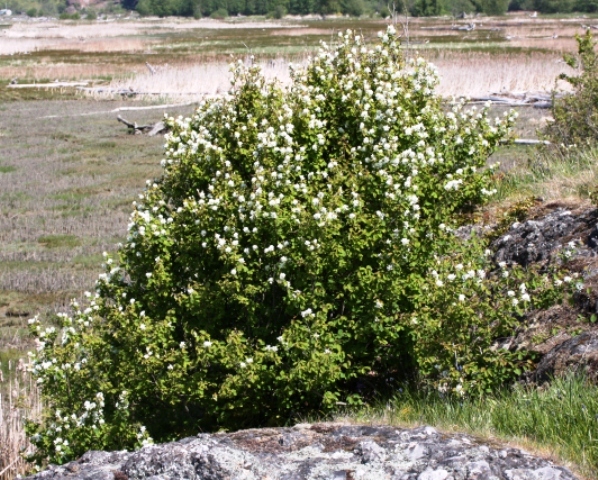 A deciduous shrub or small tree, 1–8 m high. 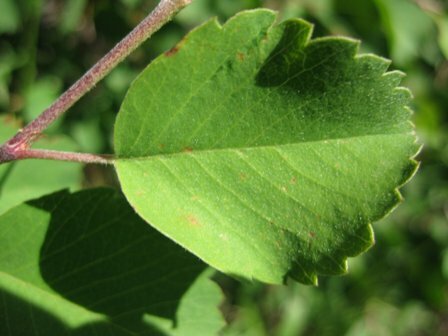 Leaves oval to nearly circular, 2-5 cm long and 1–4.5 cm broad, margins dentate, mostly above the middle, petiole 0.5-2 cm long. Flowers white, 2-3 cm across, borne on racemes of 3–20 together; petals 5 , mostly 10-20 mm; stamens 12-20; styles mostly 5. Fruit small, 7-15 mm wide, fleshy pome, purple, 5-15 mm wide. 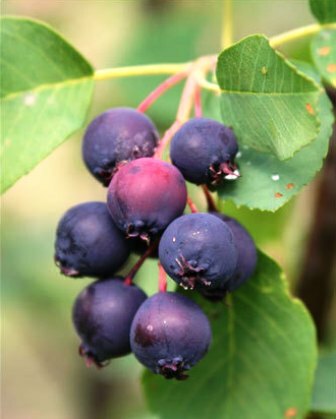 These small sweet fruits have long been eaten by Canada’s Aboriginal people as pemmican, a preparation of dried meat to which Saskatoon berries are added as flavor and preservative. These are also often used in pies, jams, wines, cider, beers and sugar-infused berries similar to dried cranberries used for cereals, trail mix and even as snack foods. Thee fruits are quite nutritious. Besides containing 15-20% sugars, these also contain about 10% protein, 4.5% fat and a variety of useful minerals. 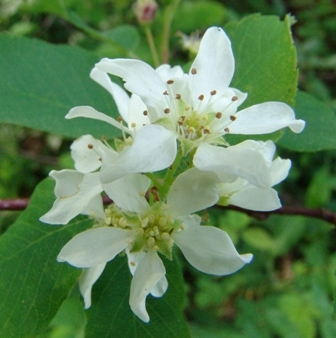 Indigenous people made arrows and pipe from the shoots of saskatoon berry plants. Juice, which is a mild laxative, was used to cure stomach ailments and it is a mild laxative. Eye and eardrops were made from mature berries. Boiled cambium can be used as a disinfectant. Root infusions were used by these people to prevent miscarriages. Saskatoon plants thrive best in sandy loam soil. Locations with mild slope have been found to be relatively better. Saskatoons can be propagated by various ways like seed, divisions, root cuttings, softwood cuttings, and cuttings from etiolated shoots. Even in vitro propagation of some cultivars has been standardized. Many cultivars have been selected and named over the years, mostly from chance seedlings. Smoky, Honeywood, Forestburg, Moonlake, Northline, Parkhill, Regent, Success, Porter, Thiessen and Altaglow are a few. Saskatoon plants begin to bear fruit when they are 2 to 4 years old. The fruit is produced on the previous year’s growth and on older wood. Usually young, vigorous branches yield the highest quality fruit. So pruning should be done in order to increase formation of new shoots, preferably in early spring after the danger of spring frosts is over. The fruit usually ripens evenly and the whole crop can be harvested at one time. The fruit can be picked by hand, or mechanically. 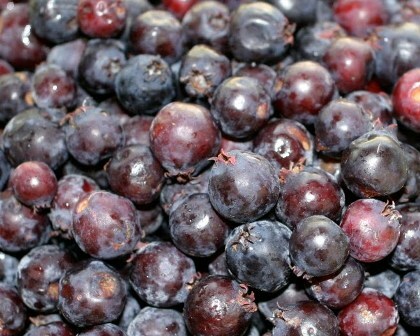 The fruit, if to be sold for fresh market, should not be overripe or crushed, torn, or bruised. Yields of up to 10 tonnes/ha can be obtained with proper management. There seems to be considerable potential for this fruit due to a sizeable demand for berries from the processing industry.